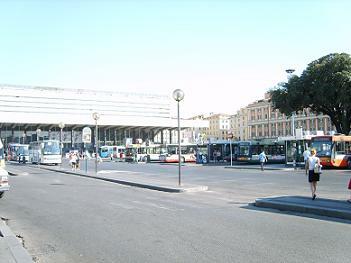 The bus station is at the Piazza Cinquecento in front of Termini Station. Besides the local public buses is here also the ‘110 Open’, a tourist sightseeing bus. It’s an open tour-bus with a ‘jump on’ / ‘jump off’ system to the attractions and sights of Rome. A ticket cost 20 Euro. Departures are every half hour. Tickets are sold near the bus. Tickets for the local bus and metro are sold by vendors (newspapers,magazines,drinks) on the street. Because there are so many vendors, it is not a problem to find one. A bus ticket cost €1.50. The Terravision bus to Ciampino Airport leaves from Via Giovanni Giolitti 38 along Termini train station. The frequency of the departures is 1-3 departures every hour (total of 28 departures in 24hr). The first bus is leaving from the train station at 4.30 in the morning; arrival is at Ciampino Airport at 5.10. The last bus to Ciampino Airport is at 21.20; arrival is at 22.00. Ticket for an adult one-way cost €4, a return is €8. Children (0-4 years) are free. Terravision operates also a shuttle bus service between Fiumicino airport and Rome city centre (32 km). The departures are 1-2 every hour (total of 24 departures in 24hr). The first bus is leaving Via Giovanni Giolitti at 4.40 in the morning; arrival at Fiumicino Airport is 5.28. The last bus from the train station is at 21.50; arrival Fiumicino Airport is at 22.45. An one-way ticket cost €4. Children 0-4 years old are free.